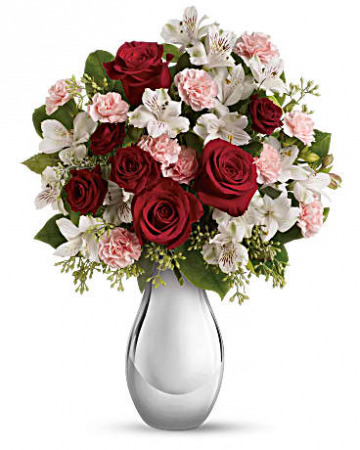 Red Roses, White Alstromeria, Pink Miniature Carnations, Filler, Greenery. Give us a call (979-865-2281) to customize this order! 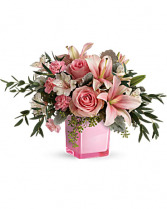 Pink Roses, Pink Lilies, White Alstroemeria, Pink Miniature Carnations, Filler, Greenery. Give us a call (979-865-2281) to customize this order! 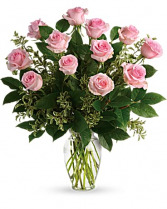 Classic Urn Vase, Pink Roses, Filler, Greenery. Give us a call (979-865-2281) to customize this order! 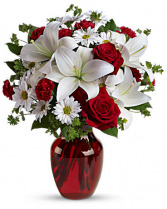 Red Roses, White Lilies, White Daisies, Mini Red Carnations, Filler, Greenery. Give us a call (979-865-2281) to customize this order!